2016 has already started off with a bang for Donnell, he has already been cast in Kevin Smith’s pilot Hollyweed. 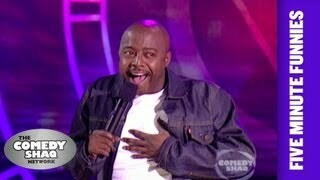 2015 was a huge year for Donnell Rawlings,he lit the stage at The Dubai Comedy Festival. He also rocked it at Montreal Comedy Festival. He has been touring all over with Dave Chappelle. In 2014 he killed during a record number of shows working with Dave Chappelle at Radio City Music Hall in NYC. You just saw him starring in his own show as Judge Rawlings on MTV2’s Guy Court. Donnell was also was a cast member on MTV2’s Guy Code. Donnell can be seen hosting Staann' Dup to be seen on StarzBlack. He lends his voice in a recurring role as “Another Cat Named Rally” on the hit animation Black Dynamite as well being featured in Adult Swim’s animation. Donnell continues to tour heavily, performing his intelligently bold stand-up throughout the US, Europe, and the Caribbean.